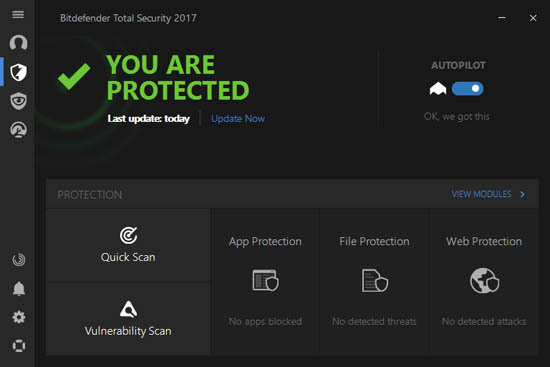 BitDefender Total Security 2017 provides an excellent protection against all sorts of Malware, and it has been re-designed to protect your private life from across several platforms, and without slowing down your system. The software deploys the most advance security technology however, it remains intuitive and simple enough for anyone to download and deploy. You need a single account to install this software on as much as 10 different devices. BitDefender Total Security 2017 provides a cross-platform protection without compromising its performance. - Anti-hacker and web safety tools that automatically adjusts to protect your device from external infiltrations. - Enhanced vulnerability scanner, alongside exploit protection and firewall. - Comes with Parental controls, as well as webcam and audio protection features. This software comes with an automatic software updater that constantly checks for apps that requires urgent updates, these apps include; Adobe reader, Firefox, Chrome, Java, and Flash. The software can optionally install these updates without the need for your input. BitDefender comes with a Ransomware protection feature. Ransomware can destroy key files and even result in loss of money. Ransomware can enter your device and then encrypt key documents or files before rendering them unusable. When you files are maliciously encrypted, criminals will ask for money to de-crypt such files, but BitDefender Total Security 2017 will help create special folders for the most sensitive files, it then notifies you about any malicious attempts to access such files. With BitDefender Total Security 2017 , you need one account to protect your devices, anywhere, anytime. This software also allows that you manage it from your browser. The software is super-fast and does not cause a slowdown of your computer even when the software is updating itself automatically. BitDefender Total Security 2017 can adequately work against all sorts of threats, including rootkits, worms, viruses, zero-day exploits, Trojans and spyware. The BitDefender auto-pilot is the feature that runs the Cyber-security by itself and then provides optimal security protection without the need for your input. With this software, you don�t need anything to configure or set up. The software does not produce nasty pop-ups and dialog boxes. The software also comes with a secured connection protection when you are using a Privacy-oriented VPN, thus it shows up especially when you are connected to unsecure Wi-Fi hotspots , ecommerce websites and other sensitive websites. It comes with an Installation Assistance tool that simply looks for viruses and adware that are secretly installed on your device alongside certain apps, while the software cleaner will simply help you decide which contents you need to remove. The software also comes with an extended anti-banner feature that deploys an effective subscription catalog that operates through a third party therefore it is more efficient in blocking pop-up ads, and many other web ads. Kaspersky seem to have worked on the user screens of this software in order to ensure that it is more usable for the new line of products that it is compatible with. Kaspersky Total Security 2017 is fully compatible with Windows 10 as well as older Windows version. This software is made available in US and Canada, however, there are plans of extending its availability worldwide, once its Beta version has been upgraded. Aside its rock-solid performance and protection, this software is very easy to use. This software, though efficient, but requires much less hard disk space for its installation. 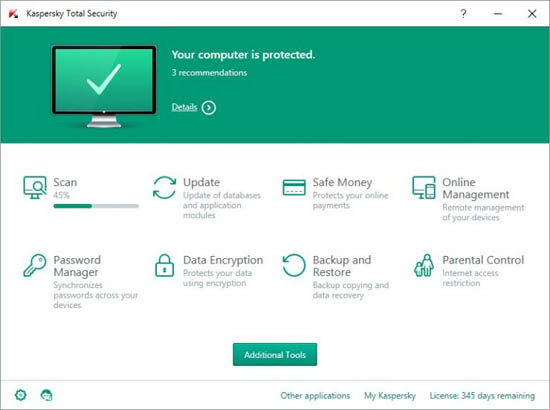 Kaspersky Total Security 2017 makes use of cloud storage systems, whereby your key files and documents are stored securely in an external device, and they can be retrieved at any time. Any damages to your device does not mean your data will be lost, they can be retrieved and restored on a new device, while your Kaspersky software is not affected. This software may not be as powerful as the likes of BitDefender 2017 total security but it can provide maximum protection for both minor and major threats, including the toughest malware, adware and Trojan. This software is competitively priced.